Laminar flow delivers a graceful stream while conserving water. Coordinate with your choice of Artifacts handles for a personalized design. Upgrade your Bathroom Quickly and Easily with a Universal Tub Spout in Satin Nickle . JAG Plumbing Products strives to bring customers the best products in Canada and make them available on the best online shopping platform: Homedepot.ca - Owned and Operated in Ajax, Ontario, Canada, JAG PLUMBING prides itself on offering Home Depot Customers durable, high quality, non OEM replacement plumbing parts. Transform your laundry room or utility area into an efficient, uncluttered workspace with this Coralais faucet. Ideal for household cleaning tasks, this durable utility sink faucet includes a plain-end swing spout, so you can direct the water exactly where you need it. Sculptured lever handles allow you to easily control both water temperature and pressure. Infuse your bathroom decor with simplicity and elegance. This minimalist Falling Water faucet trim mounts to the wall, offering a modern and functional way to accessorize your bathroom sink. The curved, stationary spout is easy to clean, while the single lever handle offers ergonomic operation. Pair this trim with a single-control ceramic disc valve for optimal performance. HydroRail allows you to easily upgrade a standard fixed showerhead to a spa-like showering experience with luxurious showerhead and handshower functionality. It's designed to accommodate a wide array of shower configurations without altering in-wall plumbing, making it suitable for both remodels and new construction. This shower column converts your single-outlet showerhead into a two-outlet custom showering experience, and has a slidebar bracket for easy height and angle adjustments to your handshower. For smooth toggling between handshower and showerhead functions, this column features a diverter conveniently located at the base of the column. Artifacts(R) Column bathroom sink spout Create a look all your own with the Artifacts collection. Timeless and classic in its inspiration, Artifacts allows you to coordinate faucets, accessories, showering, and finishes to express your personal style. Artifacts faucets combine quality craftsmanship with artisan designs to lend character and authenticity to your space - as a finishing touch or the central piece to build the room around. 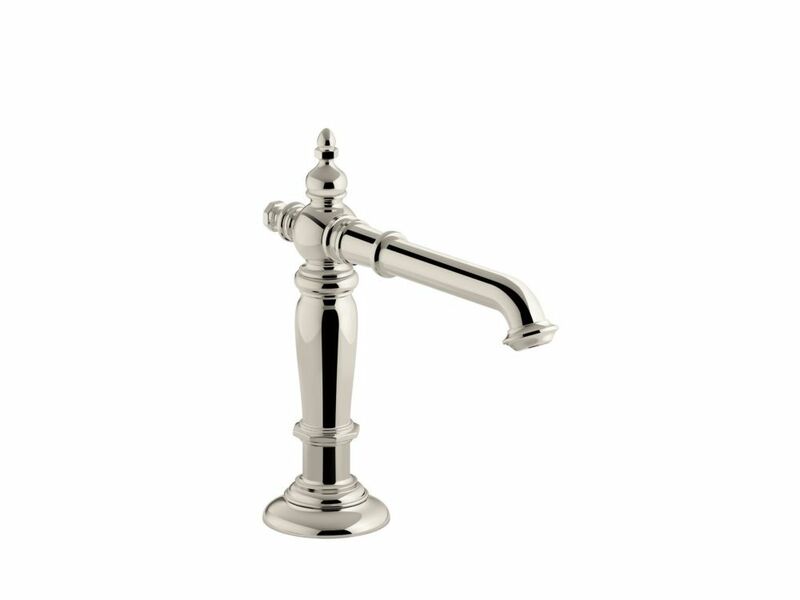 This Victorian-inspired bathroom sink spout features an elegant column design.